Sea Launch's Odyssey Launch Platform. PARIS — Commercial launch services provider Sea Launch AG returned to operations on Sept. 24 after a 2.5-year hiatus that included a debt-cleansing passage through U.S. Chapter 11 bankruptcy, the arrival of a Russian owner and the company’s move from California to Switzerland. The successful launch of the Atlantic Bird 7 satellite, owned by Paris-based Eutelsat — the world’s third-largest commercial fleet operator — sets the stage for a three-way competition to launch heavy Western telecommunications satellites with Europe’s Arianespace and its Ariane 5 rocket, and the Russian-owned International Launch Services (ILS) of Reston, Va., which markets Russia’s Proton vehicle. Whether the cyclical satellite telecommunications market can comfortably support three heavy-lift rockets, not counting China’s Long March vehicle, which is limited to satellites with no export-sensitive U.S. components, is a subject of broad debate in the industry. While Bern, Switzerland-based Sea Launch is returning to the market debt-free, it remains an international venture without regular access to any government satellite markets. The satellite will be operated from 7 degrees west, an orbital slot that Eutelsat operates in partnership with Egypt’s Nilesat, which has three satellites at that location. Atlantic Bird 7 is a Eurostar 3000 platform built by Astrium Satellites of Europe. It has a Middle East-North Africa beam with 44 Ku-band transponders, plus a separate beam with up to 12 transponders for North-West Africa. It is designed to deliver 12 kilowatts of power to its payload at the end of its 15-year service life. For Sea Launch, the return to flight is a milestone in its effort to prove to the market that it will be a reliable provider of commercial launch services for the long haul. In addition to Eutelsat, Sea Launch has secured the backing of the world’s largest commercial satellite fleet owner, Intelsat of Luxembourg and Washington. The Intelsat IS-18 satellite is scheduled for an October liftoff aboard a Zenit-3 rocket from Russia’s Baikonur Cosmodrome in Kazakhstan in a contract that Sea Launch assumed after a months-long struggle with Space International Services (SIS) of Russia, which was Intelsat’s original launch-services provider and had scheduled to use the same rocket. 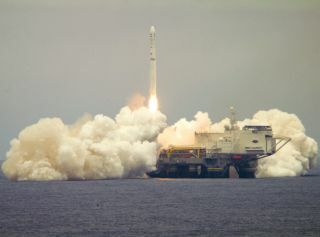 That agreement forced a delay in the launch of the Intelsat 19 satellite, which will now be orbited by Sea Launch in early 2012 from the company’s mid-ocean platform. More immediately, the Sea Launch platform, which is a converted oil rig, will be sent either to Malaysia or Singapore for scheduled maintenance. Sea Launch President Kjell Karlsen said the launch platform will be put into dry dock to replace its engines and clean its pontoons, and is scheduled to return to the company’s Long Beach, Calif., operations center by January. Following the Intelsat 19 launch the Sea Launch command ship will undergo three weeks of maintenance, probably in Vancouver, Canada. In the third quarter of 2012, Sea Launch has scheduled the flight of the Intelsat 21 satellite from the Pacific Ocean site. Intelsat and Eutelsat satellites are slated for launches in 2013 as well. The current 2012 manifest of two Intelsat spacecraft and one for Eutelsat is likely to remain where it is because of a lack of rocket hardware. Energia Overseas Limited’s investment of $155 million into Sea Launch is being spent mainly on assuring that the Russian and Ukrainian builders of the Zenit rocket system are gearing up production. The supply of Zenit rocket parts has been an issue that Karlsen said should now be put to rest. By 2014, he said, the company should be able to handle up to five launches per year. In addition to the Sea Launch operations, the Russian government occasionally uses Zenit rockets for the launch of Russian science satellites. Karlsen agreed that one of the company’s next challenges will be to persuade satellite operator SES of Luxembourg to join Intelsat and Eutelsat as a return customer. SES, the world’s second-largest satellite fleet operator, has an ongoing need of three launches per year just to sustain its current fleet. “We need to have SES in our stable as well,” Karlsen said. SES officials have said they are evaluating Sea Launch, and notably were waiting for its return to flight with the Eutelsat spacecraft. With its debt, mainly to its former principal shareholder, Boeing Co. of Chicago, now off its books as part of the bankruptcy settlement, Sea Launch has total operating and financing costs of no more than around $50 million per year, Karlsen said. The company will break even with just three launches per year, he said. Its Long Beach facility now has just 80 employees, less than half the work force there before bankruptcy.